Late last year, high school students in Kentucky asked Bill and Melinda Gates, “If you could have one superpower, what would it be?” Melinda wanted more time: more time to rebalance unpaid work between women and men worldwide. Bill wanted more energy: cheap, clean energy that’s good for the planet. In their 2016 Annual Letter, Bill and Melinda wanted to communicate these ideas to teens around the world, and they asked for Flocabulary’s help to explain the importance of both causes with these videos. Each day, women spend more time than men on unpaid care work. This chore gap is common and linked to a division of work based on gender globally. It’s an economic issue, especially for low-income countries and families. Every minute that a woman spends on unpaid work is a minute less she has to invest in her education, her children’s health and her country’s economy. What will it take to increase the value of women’s time and work? This song and video look at the effects of time poverty around the world and examines possible solutions. See the interactive lyrics, challenge questions and more. Global warming and climate change are in the news daily, as are ways to help reduce carbon dioxide emissions, like using less electricity. This video raises students’ awareness of the effects of climate change on agriculture, ecosystems and more. It explains why it’s necessary that we reduce carbon dioxide emissions to zero. The video presents the “challenge of our generation:” finding new energy technologies that don’t emit any carbon dioxide in order to stave off the effects of climate change. It describes several carbon-free energy innovations that are in development, such as artificial photosynthesis and high-altitude wind power. 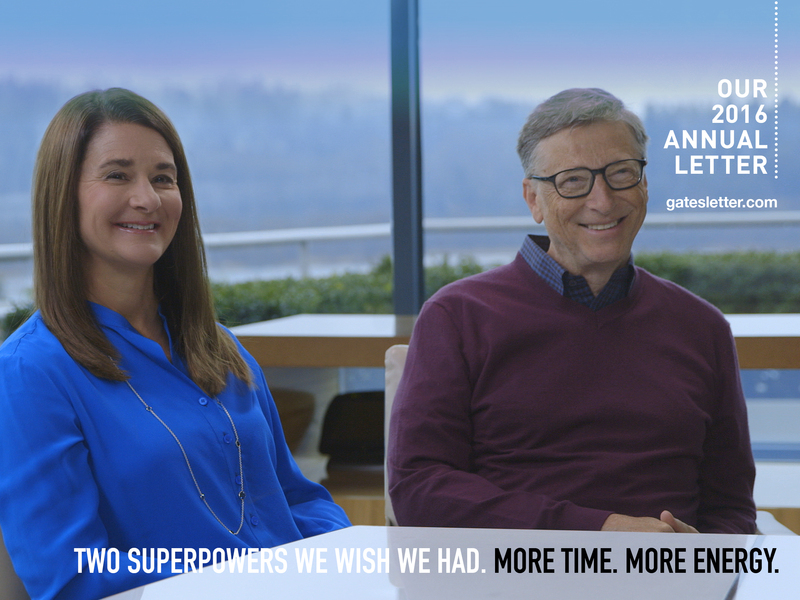 Bill and Melinda know what their "superpowers for good" would be: cheaper, cleaner electricity to help the world's poor and fairer distribution of unpaid work for women. But what's yours? How would you use a superpower to change the world? Read their full letter to learn more. 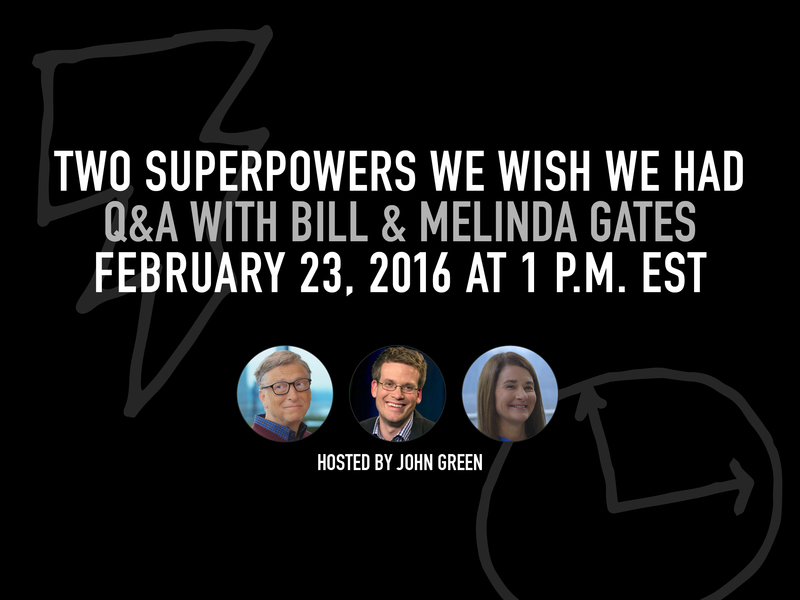 On February 23rd at 1:00 pm EST, Bill & Melinda will meet with a group of teens from around the world for a live Q&A hosted by John Green. Bill and Melinda may even take a few questions from the audience. And you can join the conversation on Twitter. Bill and Melinda have shared the superpowers they wish they had. Now it’s your turn! Go on Twitter, Facebook or Instagram to post your #SuperpowerForGood! Better yet, have your students work on this as a class project with this lesson plan!